She thinks she needs to have her life figured out. At her age, I was in a rigorous graduate program, terrified of each day, unable to free myself from a misery of my own creation. Please, I want to say, be young and untethered. Go rock climbing. Take a three-month gig at an arts camp. Get that weird hairless cat. Do stand-up. Have your car towed and then contest it. Land in the ER for various minor mishaps. Let friends of friends you barely know stay at your apartment. Sublet and move to Boulder for a year. Get tattoos in places you won’t be able to cover and dye your hair like a prism. Eat frozen yogurt for dinner every night of a long, sweaty summer. Do all these things for yourself. For me. My daughter travelled to the birth country of her literary hero. In college, she fell in love with Ibsen and played the title role in Peer Gynt, a play famous for its length and for being virtually unstageable. After she graduated, she took a train, alone, through the summer Norwegian landscape. My only child wanted to learn more about longing. When she travels, I monitor her with my motherly GPS, picturing her moving around the globe, then circling home. Norway was different. I had no visuals, never having visited there, and it was summer, a season I didn’t associate with the Norwegian landscape. When I visit the country, it will have to be covered in snow, the days masked by the short light. We are each allowed our own Norway. I pictured the inside of her train, because a train was something I knew. The compartment was charming, decorated in light blue, red, and white. Every passenger had a window with tied-back draperies, and a tiny desk with a lamp. A blanket on each lap, tea and cookies on floral-rimmed plates. And there sat my daughter, Oslo-bound, writing in her journal, safe and warm. 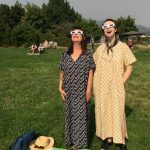 In the picture, we wear caftans and eclipse glasses. My daughter towers over me, a fact I forget until I see it documented. We look like celestial beings, not because we are heavenly or even good in the traditional sense, but because of the light. We are glowing in that moment when the sun in the shape of a crescent moon is on its way to looking like a mere nail clipping. We were in Oregon, having travelled there to watch eight Shakespeare plays in five days, something we’d done since my twenty-two year-old was in elementary school. We talked about the plays before and after they happened, and compared them to versions we’d seen elsewhere. We soaked in the nearby hot springs, and after, we got the biggest and best ice coffees in the Pacific Northwest. We weren’t exactly on the path of total darkness, but maybe a degree off. Still, we were able to experience what the eclipse meant, to feel we were living a phenomenon. The surrounding grass turned a luscious, saturated green that we tried to describe. To me the green looked like Jello. To her, it was the weird plastic “grass” accompanying supermarket sushi. In the picture, we are joyful and gazing in unison, like those images of people at 3-D movies. We were surprised when the air turned cold and damp as the sun was covered: we are not scientists! we said. We didn’t want to understand where the light went. Our exhaustion from watching so many plays made us susceptible to magic, yet, we didn’t like the woman who was chanting so close to our blanket. There is such a thing as too much. The picture was taken to send to the friend who’d made our caftans. We didn’t then know the photo also commemorated the end of our “Shakespeare vacation,” as my daughter called it during her kid years. We had gone to the plays long enough that they had completed a rotation, restarted the sequence. That the eclipse marks the endpoint has a gentle congruence. In the photo, we are ecstatic, our heads tilted skyward, slivers of the sun reflected in the plastic lenses of our souvenir glasses. We are beaming. Linda Michel-Cassidy‘s writing can be found in Catapult, The Rumpus, Electric Literature, and elsewhere. She teaches workshops in experimental prose, fiction and memoir, and conducts the Eight Books That Made Me podcast for the Mill Valley, CA Library. She is a contributing editor at Entropy Magazine, where she runs the podcast review column and co-edits Trumpwatch. She holds an MFA from the Bennington Writing Seminars and another, in visual arts, from the California College of the Arts. Linda Michel-Cassidy is at work on a collection of vignettes and a novel. She is also a metalsmith and installation artist, when time and mood permit.